In the past car components and sensors were very simple. Today’s vehicles are obviously much more complex, the result of performance improvements, improved fuel economy, legislated exhaust emissions and safety regulations. This latest vehicle technology continually monitors the major systems and responds to an increasing range of information. Complex vehicle control and monitoring systems have now become normal. In many vehicles today digital computers control not only engine functions but everything from the climate control system to headlight operation. The vehicles engine management system now requires much more sophistication in sensing and control, and therefore relies more than ever on reliable sensors and components. Most vehicles currently have an estimated average of 60-100 sensors, but because cars are rapidly getting “smarter” the number of sensors required are projected to reach as many as 200 sensors per car. These numbers translate to approximately 22 billion sensors used in the global automotive industry per year by 2020. “The development of this new technology creates a demand for quality replacement components” said Darren Van Gerrevink General Manager at Premier Auto Trade. “At Premier Auto Trade we are focussed on responding quickly to our customers’ requests, and developing an engine management portfolio driven by the latest vehicle technology. We release up to 100 new products every month and are always developing new ranges, ensuring we offer our customers the fastest evolving engine management program in the aftermarket” he added. 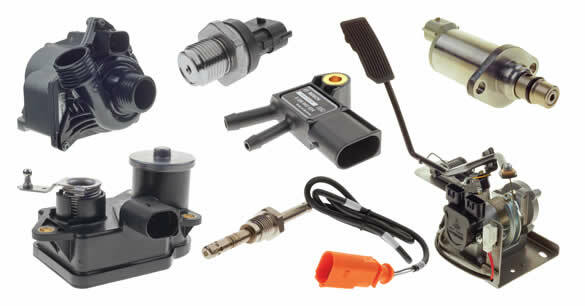 As part of this market and customer driven strategy Premier Auto Trade has recently added many new product lines to their comprehensive EFI and engine management product range, including Electric Water Pumps, Exhaust Pressure Sensors, Fuel Rail Sensors, Suction Control Valves, Exhaust Gas Temperature Sensors, Accelerator Pedal Sensors and Intake Control Valves. When you supply and fit products from Premier Auto Trade you can expect a product designed and tested to the vehicle manufacturer’s specifications offering OE form, fit and function. Premier Auto Trade distributes products throughout Australia via a network of specialised resellers and leading automotive retail groups.